This native perennial is topped with masses of soft, fluffy violet-blue flowers. It’s a member of the Aster family, but there are no rays on the flowers. Each flowerhead has as many as 50 little florets, each with 5 tiny lobes and a long style that gives the flowers a fuzzy appearance. Other asters like black-eyed susans, dandelions, and sunflowers have both ray and disk flowers. Mistflower grows 3-4 feet tall, and spreads by creeping roots. It can take over an entire border, but the roots are shallow and easy to pull out. The plant grows best in full sun to light shade, in moist conditions – it does not handle drought well but requires little attention. With a long blooming season – July through October, this perennial feeds insects well into fall. The leaves and stems die back during winter, but emerge again in early summer. Blue Mistflower grows wild in woods edges, stream banks, ditches, meadows, and fields, in nearly every county in Virginia. It is also known as Wild Ageratum because the flowers resemble those of the shorter (6-12”) annual Dwarf Ageratum (Ageratum houstonianum,) sold in garden centers as bedding plants. Blue Mistflower is usually covered with butterflies and skippers sipping nectar and bees collecting pollen. The leaves grow opposite on the stems with soft toothed edges, 3” x 2”. Deer usually don’t bother this plant because the leaves have a bitter taste. Other species with similar characteristics – flat-topped clusters of disk flowerheads – are closely related and include joe-pye-weeds, flat-topped goldenrods and bonesets. All are butterfly magnets. 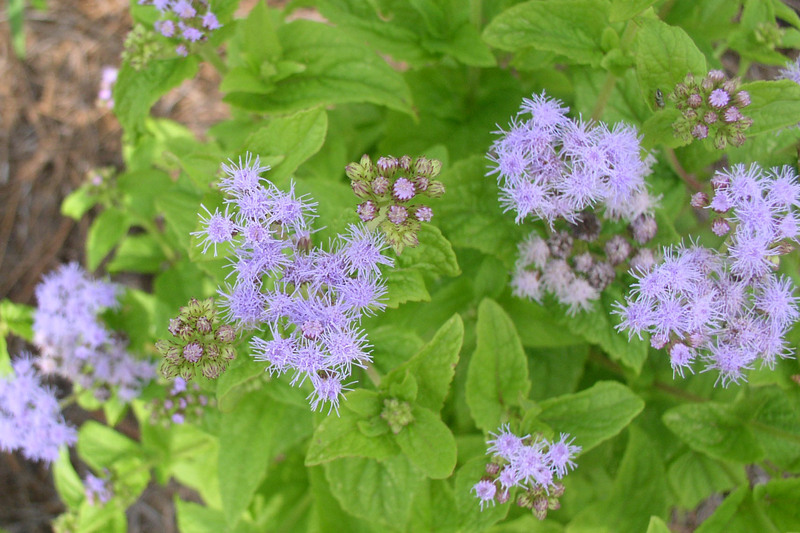 Photo: Blue Mistflower (Conoclinium coelestinum) taken by Helen Hamilton in the Williamsburg Botanical Garden, July 2006.